I love cookies. Have I ever mentioned that? I almost always have frozen cookie dough all ready for baking in my freezer. I also love Jenny's blog Picky Palate. I loved it for like a year now and that was when I started following food blogs. AND, it was when I started to seriously bake. This was my second time making these because I really enjoyed them the first time. 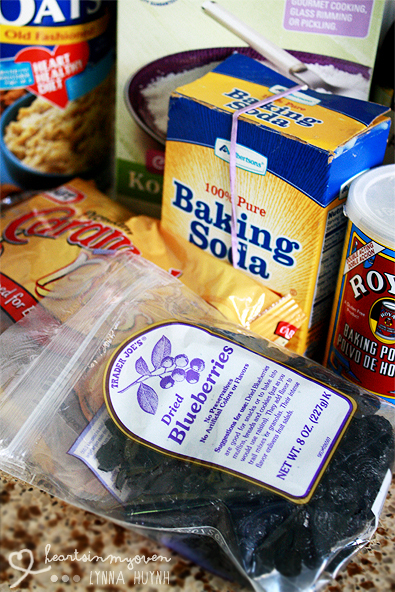 However, the first time I used frozen wild blueberries because I didn`t realize the recipe called for DRIED blueberries. hehe. Let me tell you: they both work! 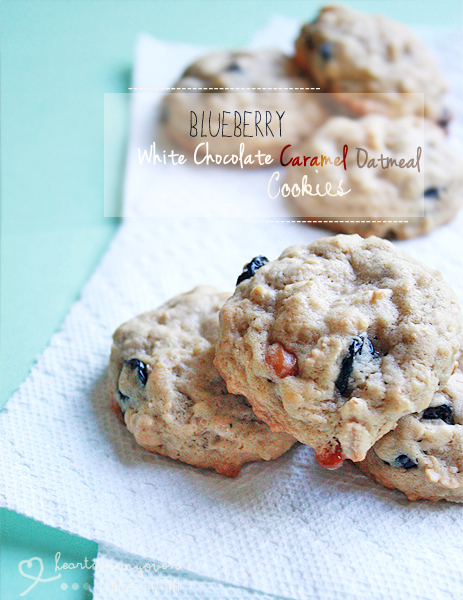 My parents actually loved the frozen blueberries cookies more than the dried blueberry cookies! The frozen blueberries made the batter wetter, so the cookies were softer than the cookies made with the dried blueberries. The cookies made with the dried blueberries were definitely more crisp. The added white chocolate chip and caramel? Gosh...so so good. I halved the recipe since I like to try different cookie recipes often and I just can't eat all of them, despite the fact that I really just want to stuff my face with them. I hope you all have a wonderful week! I have a final exam this Wednesday, so I gotta study! 1. Line your baking sheet with either a baking mat or parchment paper. 3. In a large bowl with a mixer, beat together the butter, granulated sugar, and brown sugar until it's light brown and fluffy. 5. In another large bowl, whisk together the flour, oatmeal, baking soda, and salt. Then, add this to the bowl of wet ingredients. 6. Add the caramel bits, white chocolate chips, and dried blueberries by hand using the rubber spatula. 7. Using a medium cookie scoop, scoop the cookie batter into prepared pan and bake for 9-11 minutes, rotated the pan 180° halfway through the baking time. 8. Let the cookies sit on the baking sheet for a minute or so before removing the cookies to cool on a cooling rack. WOW - what a great cookie. I love cookies that are a bit different from the typical. Can't wait to try this one! I love trying out different cookies. :) Plus, I thought my parents would enjoy these cookies more. I love dried blueberries! They really are like candy - perfect for putting into a batch of cookies. What a combination! I have never tried dried blueberries...I don't even know where to get them! But I will seek them out, thanks for this great cookie idea!! I`ve seen them at Trader Joe's and Costco! Of course Costco has like the HUGE bags. I didn't even know dried blueberries existed. Like raisins, but better! These sound and look so good!!! Really? TJ sells them! So you should definitely make these!